Found some leftover fabric. 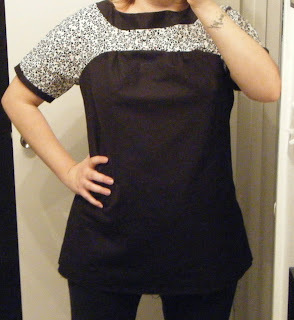 So I made another Project Runway tunic. I didn't have enough of the black so the cuffs are a little tiny. I'll probably fix that at a later date. I am for sure done now. My back hurts and I'm hungry and still stuffy. Plus I need a shower. Yeah, definitely done. I love your Project Runway tunics! I have the pattern because it was $0.99 but haven't made it. Yours look so much better than the pattern illustrations. Now I need to make one! Aw thanks! Yeah I like them a lot!